Is the land of William the conqueror and the impressionist painters and is also a gourmet delight. Inland its lush and green rolling countryside, with cow dotted meadows, orchards and half- timbered farmhouses, is a source of delectable veal and poultry, cheeses, cream, apples and pears, cider and Calvados. Along its coastline , seaside resorts alternate with fishing ports that provide a huge variety of wonderful fish and shellfish. The white and brown-splashed vache normande is renowned for both the quantity and quality of its milk, which is not only made only into Normandy’s great cheeses but also into thick creme fraiche, butter, yogurt, fromage frais and other goods such as sweet and jam. Marie Harel, a farmer’s wife in a very small village that bears its name, is credited with perfecting the recipe for Normandy most celebrated cheese in 1791. 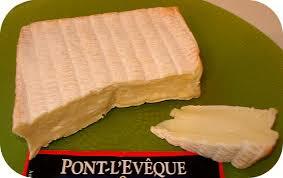 It has been packed in wooden boxes since the end of the 19th century, beginning a decoration of Camembert labels. 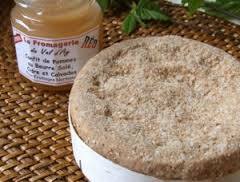 The true Normandy Camembert has had an AOC ( Appellation d’origine controlee, distinguishes quality & regional authenticity of the product)since 1985. Always look for the Camembert de Normandie. 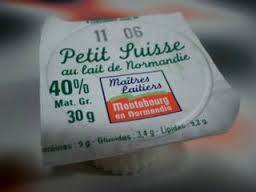 This cheese is only made in a small southern area of the pays d’Auge. It has the whiff of the stable and a kind of pronounced flavor. This cheese is round with an orange washed rind that will become stickier as it ripens. 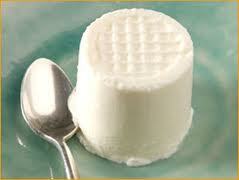 Is Normandy’s oldest cheese, its shape is square, semi-soft cheese, it gets stronger as it matures. Made since the middle ages and shaped like a heart goes back to the hundred of” years ” war, when the ladies of Neuchatel-en-bray made them as tokens for their soldiers. The cheese is mild, non- pressed with velvety white crust. This ancient cheese is very similar to le Pont L’Eveque and has a higher fat content and a creamier texture and a more pronounced taste. A lot of these cheeses are still farm -made, but do not have an AOC. 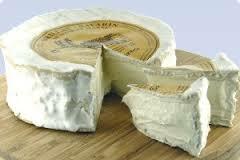 A rich triple-cream cheese, invented in the 1930’s and was named after the 18th-century gourmet and politician Jean -Anthelmel Brillat-Savarin. These tiny individual Fromages Frais are my childhood’s favorite, eat them with a little bit of caster sugar sprinkled on top. Golden, unsalted butter and thick creme Fraiche are key ingredients in Normande cuisine. Confiture de Lait ( milk jam), is another Normandy Favorite. Fromagerie Reaux. 1 rue des Blanquettes, 50430. Lessay. http://www.reaux.fr ( open by appointment only). Visits allow you to see the production and all different stages through windows. 14100 St-Martin-de-la-lieue. Open daily May -September, rest of the year is reserved to groups only. A dairy farm set around a Renaissance Manor. You can watch the production and the afternoon milking. Various roads cover Normandy cheese country. La Route du Camambert takes in 30 miles, sign posted circuit around Vimoutiers. You can start from l’ office du tourisme with the musee du Camembert giving explanations of Camembert making and also displaying the different tools and quite a big selection of Camembert labels. In Livarot there is a museum , ( Le musee du Fromage) that explains how the Livarot is being made ( 02-31-63-43-13). My favorite dessert, Le petit Suisse.